Since the introduction of the iPad in 2010, I have dreamed of the day when I could walk into a studio and record, produce, and mix a live band using just my tablet. Recently, that dream became reality: I had the opportunity to produce and record a session for Ella Joy Meir—a very talented up-and-coming songwriter and composer based in the Boston/New York area. The plan was to record “You’ll Return,” an original song that she co-wrote with Michal Weiner, using a band made up of drums, acoustic and electric guitars, bass, vocals and piano. This turned out to be a great opportunity to assess the real potential of the iPad as a reliable ultra-portable recording and production platform. Depending on the type of music, ensemble, and production you plan to produce, using an iPad can be either a perfect solution or a limiting and frustrating experience. Editing a 48-track recording session at the local cafe in Arlington, MA. The pros: I see the iPad as the obvious choice when portability and space are key issues. The ability to access your multitrack session at any time and anywhere is an incredible advantage when it comes to productivity. “Yes,” skeptics may interject, “but you can do the same with your laptop!” True, but it’s much more likely that I’ll have my 128GB iPad mini with Retina display on me—whether I’m in the studio, at home, or on the road. This constant access gives me more options for working with my music wherever I am. In addition, if you are planning to record in a space where your sound engineer and performer are in the same room, the iPad has the advantage of being dead-quiet. And then there’s the cost: iOS offers the convenience of a touch display and the portability of a laptop but with a much smaller price tag. When it came to “You’ll Return,” the iPad provided all the necessary horsepower I needed, and due to the project’s limited timeframe, it was a blessing to be able to edit the tracks anywhere I was. And the cons: All of that said, you have to manage your overall expectations. If you are used to working with professional digital audio workstation applications (DAW) such as Pro Tools or Logic Pro, you may be frustrated by the iPad’s limitations. The track limit alone (the full version of Auria only supports up to 48 tracks) can prove to be an unacceptable compromise, particularly if you’re planning to record large ensembles with individual close microphones. The same can be said about sessions that require complex editing of audio tracks, or effects-laden projects. 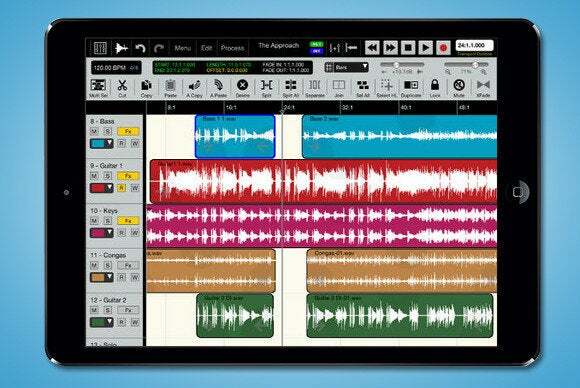 Before you can start using the iPad for a music project, you need the right hardware and software. As always, having the right tools will make your experience more pleasant and productive. Pick up the iPad: The first and most important piece is Apple’s hardware. If you’re on a tight budget, the fourth-generation iPad (also known as the iPad with Retina display) can provide a decent experience, particularly when tracking/recording or for some light mixing. If you’re serious about doing professional work in the field or in your home/project studio, however, go for the latest iPad (iPad Air or mini with retina display); you can never have too much CPU power when it comes to recording and mixing. If you want to save some money, I suggest buying a Wi-Fi-only model, but I strongly encourage that you pick up a 64GB or 128GB model. Multitrack sessions can easily (and quickly) reach sizes of 3GB or more. Having enough space on your device to store several projects (and/or different versions of the same project) is crucial. Case or mount optional, but useful: Depending on your situation, you might consider investing in a sturdy case that allows you to position the device at a good angle. I find this to be particularly important for field recordings or in live venues, where the location is sometimes less than ideal. Hook up your audio: The next crucial piece for your ultra-portable recording studio is the audio interface—in other words, what you’re hooking your instruments and microphones to. An audio interface is iPad-compatible only if it’s “class compliant;” that means it doesn’t require any driver to communicate with the audio layer of iOS. You’ll also want to consider the type of connector the audio interface uses. The majority of the interfaces that work with modern iPads connect via USB and connect to your device via the Lightning to USB Camera Adapter. USB interfaces offer several models that range from a simple 1-in/2-out box all the way to more sophisticated (and expensive) interfaces that have eight inputs and outputs. Unfortunately, one drawback of the USB option is that you can’t charge the iPad while your audio interface is connected to the device. In practice, this isn’t such a big deal—at the end of the five hour session I did for “You’ll Return,” my iPad mini still had more than 60 percent battery left—but you’ll want to make sure you charge your device fully before any project. In general, a newer iPad should be able to handle seven to eight hours of recording. If it’s crucial for you to charge your iPad while recording, you need to use a Made For iPad (MFi) interface. These are more sophisticated interfaces that connect directly to your iPad’s Lightning connector and are able to transfer power and digital audio data simultaneously. At the moment, the only MFi models available are those by Apogee and Avid; only Apogee models charge your device. As picking the right interface for your project can be a daunting task, I suggest checking out the excellent information page found on the Auria app’s website, where you can find a complete list of audio interface (both USB and MFi) that are compatible with the iPad. For Ella’s song I built my portable studio around Focusrite’s Scarlett 18i8 ($349). It provides excellent value for the money and is extremely flexible with its four mic pre-amplifiers, four analog line inputs (for extra high quality mic-preamps), one digital input in ADAT optical format, MIDI in and out, and SPDIF in and out. The number of total inputs and mic-preamplifiers your interface should have depends on the type of recording session you are planning to do. There are two basic types of sessions in which you will record with your iPad: Studio sessions with overdubs and live sessions in which you record all the instruments simultaneously without overdubs. In general, a studio session requires fewer inputs, as you will be tracking/overdubbing one or two instruments at the same time. For the “You’ll Return” session, the Scarlett 18i8 allowed me not only to use the four built-in mic-preamplifiers, but also to add four external mic preamps. In this case, I used high quality preamplifiers configured in a portable API “Lunchbox” 500 format. The four extra mic preamplifier (API, Neve and Chameleon) connected to the audio interface via line inputs. When it comes to instruments, drums usually require the highest number of simultaneous inputs—anywhere from a minimum of three (overhead, bass drum, and snare/high-hat) all the way to seven or eight (two overheads, bass drum, snare, high-hat, and toms). For a live session, since you have to capture the entire band without overdubs, eight inputs is really the minimum needed for a small band with drums, bass, piano and vocal. A typical iPad setup for a recording session at a live venue. If you plan to record more than eight inputs at the same time, you need an audio interface that features one or two ADAT digital connectors. Each will allow you to connect an additional unit of analog to digital converters with an extra eight inputs each. Tune up your software: Last but not least, you’re going to need the right software to record and mix your recording. The App Store features several decent applications that can serve as your basic DAW for the iPad; Auria and Cubasis are the only two apps that I feel confident recommending if you want to get close to a desktop-based recording experience, however. While both are capable of handling multi-track recording, mixing and audio editing, I usually use Cubasis for the pre-production phases of a project, while I prefer Auria for recording live instruments, editing, and mixing. The main differences between the two are that while Cubasis can handle MIDI tracks and software instruments, Auria doesn’t support MIDI. On the other hand, Auria offers exceptional audio editing and mixing features, some of which would make seasoned Pro Tools users feel at home on the iPad. If you need to incorporate MIDI and audio instruments, I recommend recording your MIDI parts in Cubasis, rendering your MIDI tracks as audio files, and then importing them into Auria, where you can record the acoustic instruments. Click here for part two of Andrea’s journey, which tackles the recording, mixing, and post-production process on an iPad.